When we’re on the go, many of us grab a protein bar as a snack. While a protein bar can provide quick energy, it also can provide quite a bit of sugar and an equally quick post-energy letdown, not to mention some dubious chemicals which make them questionable for certain medically necessary diets. I have found a healthier option which not only benefits the body, it benefits the economy of people in great need. Tanka Bars have a slightly unusual but very pleasant taste. I carry a bar in my purse and one in my gym bag at all times in case I find myself having to go too long between meals. They are a handy backup in social eating situations when I can’t be certain that what is being served is safe for me. And I sneak them into movie theatres so I have some protein to go with my popcorn. Native American Natural Foods has recently expanded their product line to include a spicy pepper blend, which I have not yet tried, and their original recipe in bite-sized nuggets that come in a re-sealable package. 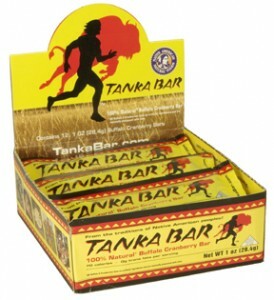 Tanka Wild is a snack stick I really love as it has the same ingredients as the bar but with the addition of crunchy wild rice. Two products on their website that I have not yet seen in stores are summer sausage and hot dogs, both made from buffalo. I am particularly keen to try the hot dogs as they have half the fat, no corn syrup or any of the fillers you find in most beef products. According to the company’s website (http://www.tankabar.com/), “Our products are certified Gluten Free by a third party accredited laboratory and tested below the minimum detectible quantity of 10 parts per million. One part per million is equal to one milligram of gluten per kilogram of sample product.” They are also free of the these common allergens: nuts, fish, soy, eggs, MSG and shellfish. Only one of their products, Tanka hot dogs, have any traces of dairy. Their products are diabetic-friendly. The Tanka Bar Spicy recently won an award from “Backpacker” magazine as their Editor’s Choice 2010. The availability of Tanka products is rapidly expanding, now being sold in 4000 stores nationwide including REI, an outdoor recreation chain. You can do a search on the Tanka Bar site to find a retail location nearest you. I did a search and found to my surprise that my local drugstore now sells their products. From the company’s website: “‘Tanka’ is used in reference to delivering your best with all your heart, mind, body and spirit. It is the choices that you make and the actions that you take to be who you are. Whether you’re Native, white, black, yellow or brown, it is your ability to overcome, to extend a helping hand for those in need, to defeat racism, to protect our Mother Earth, and to love all others on our planet. It is your ability to acknowledge ‘Mitakuye Oyasin’ — we are all related.” I encourage you to visit their site and click on the “Buffalo Nation” tab to learn more about the Oglala Sioux tribe, its history and how the buffalo ties into its culture. May try to boost energy?